Adrian Sutil's father Jorge was born in Uruguay but moved to Germany when he was 28 after winning a musical scholarship in Cologne. He went on to become the lead violinist of the Munich Philharmonic Orchestra and a noted violin teacher. Not surprisingly, his son Adrian grew up surrounded by music and was an accomplished pianist before he discovered kart racing in 1997, when he was 14 years old. He rose quickly through the ranks to become a factory driver with Birel and then in 2002 turned to cars in the Swiss Formula Ford series - which he won. He switched to Formula BMW in 2003 and finished sixth in the German series and then jumped straight into Formula 3 in 2004 with Team Kolles. He finished 15th in the championship and sixth in the rookie standings. 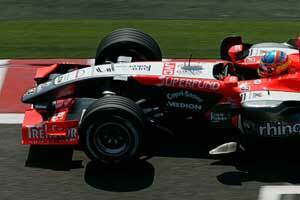 He stayed in the series in 2005, moving to ASM where he was Lewis Hamilton's team mate. He scored two wins and two poles but was overshadowed by Hamilton and at the end of the year decided to go to Japan to race for TOM'S in the Japanese Formula 3 series. He also did a deal to test drive on several occasions for the Midland F1 team, run by Colin Kolles, his former boss in F3. In addition he raced for A1 Team Germany in the A1 Grand Prix Series. The connection with Kolles played an important part in Sutil being named as the second driver for the Spyker F1 team (the Midland team renamed) in 2007.